Here are some facts about Marie Antoinette. 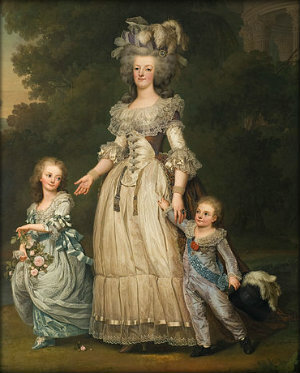 Marie Antoinette was the Queen of France, from 1774 to 1792. She has become one of the most well known women of all time, although the French people disliked her. She was born in 1755 in Austria, and at just 15 years old married the future French King, Louis XVI. Over 5,000 guests attended their wedding ceremony. Marie Antoinette and her husband moved to the luxurious Palace of Versailles, near Paris. A smaller castle was built in the grounds for her personal use and to allow her to escape palace life. Marie Antoinette had a model farm built on the palace grounds so that she could dress as a maid. She had some unusual interests, such as hot air balloons and the Inca people of Peru. Marie Antoinette had her own hairdresser who spent many hours on the Royal hair. Her hairstyles were often 4 feet high. She was beheaded in October, 1793 in what is today the Place de la Concorde, in Paris. Just before her execution, she apologized for treading on the executioner’s foot. Marie Antoinette is famous for saying ‘Let them eat cake’ when she was informed that the people of Paris didn’t have any bread to eat. However, there is no firm evidence that Marie Antoinette ever uttered these words. After her death, her body was buried in an unmarked grave near a Paris church. In 1815 her body was dug up and she was buried in a church in northern Paris. She has been depicted in almost a dozen films, as well as many novels and biographies. She was painted by several artists, including Elisabeth Vigee le Brun, her personal painter. The town of Marietta, Ohio in the US was named after her. The town’s founders wanted to honour France, who had helped the American patriots defeat the British.